Cordova offers a complete array of facilities and accommodations to meet your needs including a contemporary style 43 room hotel with a restaurant and bar overlooking the harbor and an historic 40 room lodge with a full service dining room and conference facilities for up to 60 people. For those attendees who prefer to get away from it or may be seeking options to extend their trip, Cordova offers numerous alternatives such as B&B’s and cabins overlooking streams, sloughs and lakes. An array of area tour guides, sport guides and outfitters provide both in and out-of-town adventure. This timeline provides a checklist for your program. Adapt it to your own particular needs — establish your own “ideal” and “can’t-miss” due dates. Determine the objective of the meeting and develop the program and budget. Send letters of agreement to hotel and suppliers. Set up master account for your meeting charges with the hotel (authorize who can sign charges). Invite speakers and inform them about your attendees and the facilities of the hotel, including audiovisual capabilities. Notify attendees. Make travel arrangements. Confirm menus, room setups and supplies in writing with your event manager. Monitor speakers’ presentation development and offer assistance in reproducing any handouts. Order signs and printed materials. Order gifts and amenities. Arrange deliveries of gifts (and meeting registration materials) with your hotel contact. Mail attendees the agendas, suggested dress and other instructions. Check with your speakers regarding the progress of their presentations, audiovisual and logistical arrangements. Submit rooming list to hotel and confirm arrangements for amenities. Confirm your meal and beverage counts for the first day food functions. Ship materials to arrive 24 hours before your arrival, and confirm arrival before leaving your office. Recommended shipping for Cordova is USPS Priority and/or Flat Rate. We do not recommend Fed-X to our location. Confirm all audiovisual requirements and produce slides. Make arrangements for shipping materials back to your office after the meeting. Review details and walk through your meeting space with your property event manager. Personally inspect shipped materials to be sure that all of your items have arrived and that they are in good condition. Check the hotel function board and front desk for posted times and locations of your functions. Check function space one hour in advance. Notify your event manager immediately of any changes in your plans or requirements. Sign banquet checks each day and keep an ongoing record of your on-site expenses. Meet with your event manager to review your sessions, charges and receipts. Cordovans love any excuse for a party! Over the years the community has created a family oriented, fun filled calendar of festivals and events that highlight the town’s character from fishing to forests. Ice Worm Festival – Cordovans love to blast away the winter flurries with a week of activities and celebrations. Fireworks, a Variety Show, survival suit races in the harbor, and a great parade are just some of the many activities. Copper River Delta Shorebird Festival – Up to five million shorebirds stop on the Copper River Delta to rest and feed during their annual spring migrations. Cordovans celebrate with viewing tours a bird count and plenty of workshops and community events. First Copper River Salmon Harvest – Witness the bustling activity of a working fishing town as our fleet gears up for the opening of the commercial fishing season. Join the town on the docks to welcome the fleet in and celebrate the return of those prized wild Copper River king and red salmon. Meet the fishermen on the docks and head over to a local restaurant for some fresh salmon. Copper River Nouveau – Prince William Sound Science Center’s annual gala fundraising event featuring a fabulous guest chef, live auction and games. Cordova Museum Fish Follies Juried Art Show – The annual juried exhibit invites artists from throughout the United States to submit fishy works of art. Old Time Downtown 4th of July Festival. This free-to-all festival is an old-fashioned community celebration. Kelp-box derby, kids games, square dancing, woodsman contest – and fresh grilled Copper River wild salmon barbecue, community potluck and homemade pie social. It’s free and open to the public. Cordova Fungus Festival – Mushroom experts, renowned chefs, artists and fungus enthusiasts gather for workshops, forays, and a gala gourmet dinner. Email erinecooper@yahoo.com for more information. Annual Holiday Tree Lighting and Christmas Bazaar – Santa and the Cordova Volunteer Fire Department parade down First Street to kick-off the holiday season. Tree lighting and open house at The Cordova Chamber of Commerce, craft bazaar at Bidarki Center with locally made crafts, art and more. To reserve your date at the Cordova Center, meeting facility call 907-424-6665 or visit thecordovacenter.com. 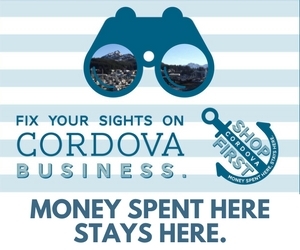 To start planning your trip, call to the Cordova Chamber of Commerce. We’ll help you get rolling with planning your site visit and getting connected with local vendors to supply all your meeting needs.